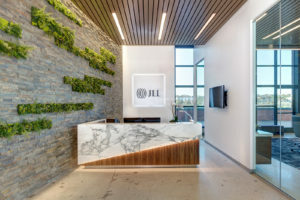 February 2017 - ID Studios, Inc.
JLL turned to ID Studios for its expertise in corporate workplace strategy & design when contemplating its new office location in San Diego. Designed with flexibility in mind, one of the most striking features in JLL’s new office is a retractable “sky wall” which, when open connects the boardroom to the lobby, providing enough open space for all hands meetings and events. With the café and adjacent outdoor deck just a few steps away, the space is also great for entertaining, teamwork, and collaboration. You can see more pictures HERE. JLL’s office has also been written about in many publications such as the San Diego Business Journal and Globe St.